House Speaker elect Craig Paulsen (R-Hiawatha) and Linda Upmeyer. 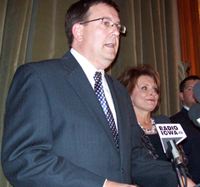 The soon-to-be top leader in the Iowa House says the top priority for Republicans in 2011 will be cutting “hundreds of millions of dollars” from the current year’s state budget plan. Fifty-nine of the 60 incoming members of the Iowa House who are Republicans met this morning and unanimously chose Kraig Paulsen of Hiawatha to be speaker of the House. “We now control the agenda and I guess we’re going to put together an agenda that reflects Iowa’s values and what we think the electorate told us last Tuesday,” Paulsen said this morning during a statehouse news conference. Budgeting cutting is the highest priority, according to Paulsen. “We need to start putting it on paper and start adding the numbers up before I commit to an exact dollar amount,” Paulsen said, adding the plan will likely pare “hundreds of millions” from the current year’s state budget. Election officials have not yet certified all the vote tallies in Iowa and the outcome of a couple of state senate races is still undecided, however it appears Democrats will hold a slim 26 to 24 seat advantage in the state senate. It means Republicans will control the debate agenda in the House, while Democrats are likely to control the debate agenda in the Senate.